Organizations train the head and hands of new managers, but all too often, they fail to provide training that addresses the heart and soul of new leaders, essential for developing a philosophy of empowering leadership. As Baby Boomers retire, the ranks of managers and supervisors are being depleted. Organizations also are losing the wisdom carried by experience, hard-won repositories of technical knowledge, and personal case studies of problem solving. Further, networks of professional contacts that aided internal and external collaboration, innovation, and team performance are gradually diminished and weakened as Baby Boomers exit the workplace. From the perspective of Millennials and members of post-Baby Boom demographics, this leadership vacuum is disempowering and frustrating. When leadership is ad hoc and constantly churning, it is difficult to win resources and commitment for projects or plans that extend beyond the organization’s current fiscal year, or even shorter event horizon. If your organization is one of the 94 percent of global businesses that admit to not doing enough to secure the leadership future of the organization, you’re probably wondering what it will take, what it will look like, and where to begin to create an internal context that assures the ongoing development of leadership. Communication shifts from fault finding to focusing on opportunities for increasing performance. 1. Where are we going? 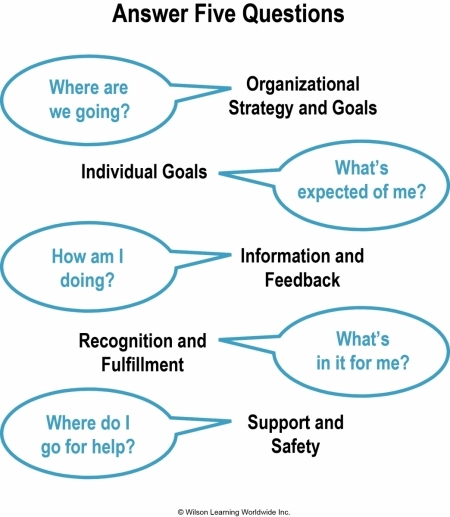 First, identify and clarify the strategy and goals. The leader ensures individuals understand how daily work activities fulfill on strategy and contribute to achieving team goals. 2. What’s expected of me? At all times, leaders make sure individuals and teams know what is expected of them in order to contribute to driving the organization’s strategy and achieving individual, team, and organizational goals. Making expectations clearly understood is an ongoing process. 3. How am I doing? People perform better when they know where they stand. Frequent feedback and reinforcement become part of an ongoing conversation with each team member. Individuals and teams need to be able to adjust as conditions change. Lack of feedback can cause teams to fracture as each individual creates a different account of the team’s progress. 4. What’s in it for me? True leaders understand that work means different things to different individuals. They learn how to keep the rewards for sustained performance improvement within reach. 5. Where do I go for help? Leaders are a source of support and safety when things don’t go as planned. Leaders know that when mistakes are made, or processes break down, there are performance breakthroughs waiting to be discovered. When individuals trust their leader will be “hard on the problem” but “easy on the person,” the entire team begins to problem solve in a new way, and team performance takes a leap forward. Tom Roth is chief operating officer of Wilson Learning Worldwide. He is responsible for the strategic direction and business performance of Wilson Learning Worldwide operations, and leads the global marketing services and R&D solutions group. Roth assists global executive leadership teams with issues related to employee engagement, leadership development, strategy alignment, and business transformation. Prior to his current role, he served as president of Wilson Learning Americas. Roth has more than 35 years of experience developing and implementing human performance improvement solutions. He is a published author and frequent speaker at global conferences and client events. To learn more, contact Wilson Learning at 800.328.7937 or visit WilsonLearning.com.